As of Sunday night, there is some consensus among local forecasters that a significant snow event (for April, anyway) is on the way. Check out our spreadsheet to see the progressive forecasts leading up to Tuesday evening. The most striking prediction to us was the confidence displayed by normally conservative KARE11 in predicting a significant snow event. WCCO continues to show models with projected snow amounts that they don't really agree with, which doesn't make any sense to us considering theirs is a visual medium and some people watch with the sound down. Normally conservative KARE11 is bullish on the storm. This screenshot suggests Mike Fairbourne is predicting 9.1" of snow. But that's not actually what he said. Dave Dahl says Tuesday night's storm will be similar to Friday night's. We'll provide a forecaster recap later tonight for the possible snowstorm Tuesday night and Wednesday. At this juncture, there appears to be considerable variance in what forecasters are thinking. KSTP is poo pooing any chance of real snow (instead forecasting primarily rain) while others such as KARE (per tweet from Sven Sundgaard) see either snow or no precip at all. Biting my finger nails... lots of possibilities with this Tuesday storm, could be lots of snow, or does it head south and we're just cold? I will not be surprised if a foot or more of snow falls over so. and/or central MN by noon Wed.
"I think the accumulating snow is pretty much behind us. Some rain showers on Tuesday and Wednesday that could get a little flaky from time to time." The models agree on the timing of the next storms (late Tuesday through midday Wednesday), but not the amounts. The range: 4-14", give or take a foot. Throw out the highest and lowest values and you still wind up with a midrange prediction in the 4"+ range. We'll see. It's still (very) early to be attaching inch-amounts to the forecast. Could it be "plowable"? Absolutely. ackkkkk! I hope they are wrong! well being as that my kids still have not had snow day in this record breaking winter and since the snow won't stick around for long...i say let's just go for the #1 spot and get that snow day to boot! I have not enjoyed the weather the past few days. I am ready for 60 and sunny please!!! latest NAM model bringing in a foot of snow for all of the metro,Novak maybe onto something! BRING IT LETS BREAK THE RECORD! wait a minute, sorry this is the latest Nam run. I don't see a foot for anywhere in the metro, besides when it gets officially measured at MSP once every 6 hours, it will take compaction into account, 6-8" would probably measure out to something like 4-6". randyinchamplin,what NAM model was PD showing on his blog,it was a foot for all metro? Anyway what are your thoughts on the storm? I'm waiting for the ECMWF to come out on the Penn State E-wall site, but I expect it will be similar to the UKMET. NWS has 4 inches as of now for tuesday night,DD on blog calling for 'couple of inches',snow is coming question is how much is it going to be,Novak you have anything new to add. DD is obviously placing his stock in the Euro model runs. However, the Euro's are also showing enough cold air to place most of the precip. as snow throughout the duration of the event. This time of year, I tend to believe that a more northern solution to a storm's track is likely. I'm siding with the GFS & NAM on this one and I like how they hit southern MN hard. Surface low should track from MCI to ORD. very interesting, I just took a look at the Euro ensemble mean and this system sets up further west than it's operational run. The ensemble mean shows this system in NW lower MI at 12z Wednesday. It just so happens that the 18z GFS operational sets it in that same location at 18z. So if DD is basing his forecast on the operational Euro, he may have a problem on his hands. At this point, I want to say "plowable". That might change, of course. I'm not a big Fairborne fan but he showed the storm shifting south. Heaviest to the SE and then through green bay. Thoughts? Conservative kare11 said we may get nailed. Thoughts? How absurd,how the hell can WCCO(Mike Fairborne)show a graphic of 9.1 inches of snow and not stand behind it,saying the most going south and into wisconsin,then why the hell do you show it if you dont agree with it,you know i hate the forecasters that keep saying"the models are saying this" and the models are spiting out these numbers"were less then 48hrs from the event give me YOUR forecast thats why your a weatherman damn it,predict it and stand by it,right or wrong! big daddy, I can't add anything to what you just said. I'm just trying to envision Fairborne doing his taxes, "the computer is saying I owe $500. But, I am going to put down a refund of $1,000." It's okay to not agree with the models, but then he should put his prediction on the screen, not the "wrong" model estimates. Baffling. I'll just repost my comments from Saturday with a few adjustments noted...and add a total of about 2-4" of very wet snow for the MSP area (heaviest to the SE). I think the snow band will be south and east of the MSP area. The system will be coming out of the Pacific with a lot of speed, so cyclogenesis over the plains will be further east than a slower moving and more southerly storm. The GFS 500 hPa heights have been steadily trending further SE with the wave (NOTE: this is no longer true, GFS has reached a steady point with the forecast). SREF guidance shows a lot of uncertainty with the (NOTE: north/west) low track, but the mean takes it too far south and east of MSP to bring the (heavy) snow there. With high certainty, looks like it'll be cold enough for snow in MSP. Heavier snow will probably be a Mason City-Eau Claire-Green Bay (EDIT: Mankato-Eau Claire-Marquette) line. NAM looks too high with QPF...I would expect strong convection along the cold front moving through the plains to transport some of that moisture back to the surface. National Weather Service says less than an inch of new snow when I type in a Saint Paul zip. I'm feeling just fine and I don't know where some of these graphics came from. I never go far from the NWS readings or reading METAR's myself for current conditions. Bizarre...the NWS forecast for my town of Lake City had the phrase "3 to 7 inches" in the Tuesday Night block, and now that phrase has been stricken from the record. Its starting to be downgraded all over the place. Hyper for one day, reality sets in the rest of days. This storm is well advertised by most of the models and has been for several days. NO weather forecaster should be surprised if/when we receive heavy snow tomorrow into Wed. AM. Of course, weird things can still happen, but thermal profiles now point at event as mostly all snow. There will be some liquid on the fringes of the precip. shield, but the inner-core of the shield will be all snow and it will fall at a torrid clip for several hours. This should turn into a branch breaking, wet & heavy snow for almost all of southern MN. Right now, the axis of heaviest snow should run from Albert Lea to Red Wing to Eau Claire. SE Twin Cities metro should receive more snow than the NW suburbs. Sharp cut-off as you head NW of St.Cloud. However, everyone will recieve a thick blanker by noon Wed.
Latest 12z NAM Bufkit data prints out 16.5" for Rochester and 6" for MSP. Wow! 12Z NAM is in excess of 6"
12Z GFS came in much warmer, and only a half an inch. I would not be suprised if NWS downgrades the MSP to a winter weather advisory, or to nothing at all. I do not really see how this can turn out to be a warning event for MSP. I even have that as a bumper sticker! A Winter Storm Watch -> Winter Weather Advisory is not a downgrade. Watches either need to be cancelled or converted to an advisory or warning once the event arrives. No long-fuse watches in the first period. When I had some time this weekend I was burning up my computer running a radar program watching the severe outbreak of the last three days, my heart goes out to those across the south and the east that were impacted. Green Bay, as it deepens it drastically, it will bring high QPF's to the area, around 1.5", with the majority of that falling as snow. In addition to the surface low it digs a strong negatively tilted 500 mb trough with it and lifts that to WI and and Great lakes region as well as a 700 mb low that stacks nicely with the surface low. The question is can you believe it? At this time the 12z ECMWF does not dig the 500mb trough nearly as deep as the GFS and keeps us more or less in a zonal flow. Therefore it is much faster with the surface low and not nearly as strong with a more southerly track and what looks to be about 1/3 the precip. At this time I would expect to see a repeat of Friday night based on recent trends. from winter to spring the GFS and other US models suffer from GIGO, or if you prefer JIJO. They don't pick up on the real solution until the systems come on shore. How embarrassing, the ECMWF has outperformed the US models by leaps and bounds the last 4 weeks. Having said that, Rochester and vicinity may get the brunt of this system, the metro should be removed from any watches or advisories . "Having said that, Rochester and vicinity may get the brunt of this system..."
It may be more than a snow day, wet heavy snow could play havoc on the power lines. Well ok MPX has issued a Winter Weather Advisory for the metro, I would defer to them. Kare 11 is showing the heaviest snow in LaCrosse, but saying it might go even further southeast. Trace to 3 depending on where you are in the metro. I'm liking their forecast; I hope they're right. Giving the kids their first snow day on April 20th would have been entertaining, but Wisconsin can have it! So how much for Red Wing? Anyone have their own predictions for me? I predict 5 inches. I'm hoping snowday Wednesday and no track meet tomorrow! PD updated again just before 6:00 and is calling the storm 'on again.' He said that the models that were suggesting a southeastern shift earlier in the day have started to come back together nearer to what they were estimating earlier. He sees 3-7" for the metro, 1 in 3 chance of 6-10 somewhere in the vicinity. He even suggested that the NWS jumped the gun in changing the WSW to a WWA before final model runs were in. Yikes. I just loaded the 18z nam and gfs into bufkit, and the difference is startling. the GFS says 2-3 for MSP, the Nam 16". Could the Nam be picking up on convection in far northern IL either just before the snow or during it?....if that's the case it would wrap extra moisture into this system and drop it on the cold side. Stay tuned!!! Novak, what do you think? and btw that is using the omega zone on bufkit as opposed to the max temp in profile temp method. A Winter Weather Advisory (WW.Y) IS NOT a "down grade" from a Winter Storm Watch (WS.A). Watches are issued prior to advisories/warnings. A watch is intended as a heads-up, or "watch out". Advisories and warnings are issued for when those conditions are occurring or imminent. I'm not exactly sure on the criteria for the NWS MSP office, but it is probably 2-6"/12 hours is advisory, 6"+/12 hours is a warning. A WS.A is issued 2-3 (sometimes up to 4) days in advance of a potential winter storm. Potential! It reflects a 50% certainty level of *warning* criteria being reached. An advisory and a warning reflect an 80% certainty level of criteria being reached. Let me say this another way. A potential winter storm is coming. 3-7 days before the storm is expected to arrive, I would likely issue a Hazardous Weather Outlook, reflecting 30% certainty of advisory or warning criteria being met. Then, 2-3 days before the storm, if my certainty continues to rise toward 50% I would issue a watch. If I'm very confident (80%) that it will just be advisory level snow, I may just go with the advisory at this point, but most often you'll go with a watch. Finally, 12-24 hours before the event, the meteorologist will convert the watch to an advisory or a warning. Honestly, I don't know what all the fuss is about. All models have been rather consistent with this storm, especially in the last few runs. The only difference appears to be in QPF and too many forecasters place way too much faith simply in QPF. - Divergence, strong jet core and a couplet at 250mb over the Upper Midwest. - Increasing vorticity on Tue. at 500mb signifying an intensifying storm. - 700mb low passing directly over southeast MN. - 850mb temps well below 32 degrees. - Thermal profiles at all levels (except surface) near or below 32. - Abundant moisture overrunning dome of unseasonably cold air. Do we need more evidence for snow? If you were to base your forecast strictly on QPF, then you should be predicting 12" - 16" of snow since the 18z NAM cranks out 1.41 in. of liquid precipitation. I was always taught to go back to the basics and look for consistencies. Never let one parameter, like QPF or Storm Track rule over all others. The models, in general, have been consistently showing a robust snow environment for quite some time. Go with it. 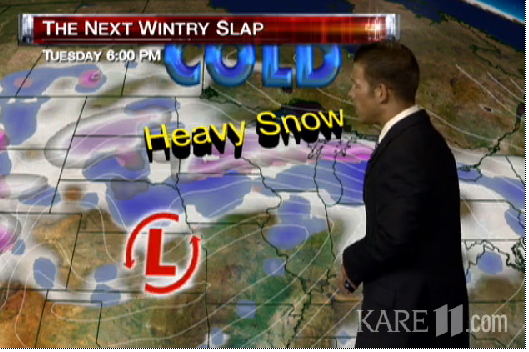 On a side note: It does appear that the axis of heavy snow will develop just southeast of the metro. I would expect heavier snow totals in the southeast metro compared to the northwest metro. @Annonymous: Dave Dahl used the term "downgrade" from the watch to the advisory. I do think that's a common impression, if not an accurate as you suggest. PD said "downgrade" too, but his point was more that they should have held onto the watch longer in case the better move was to change it to a WSW. He feels they jumped the gun. Those are what I'm looking for, it just doesn't have the NAM model on there (From what I can find)and I'm wondering if any site has more detail than that. Anyone who has followed weather for a while knows that the natural step after a winter storm watch is a winter storm warning. An advisory is not going to produce heavy snow. Unless they are wrong with the forecast. The NWS may not use the word downgrade but in essence it is. If they felt, at the time, that the storm would produce 6 + inches, they would have issued a warning. If the latest models hold they will issue a warning. Would you say upgrade then? I bet you would, anonymous.